Meanwhile, we must not forget that most IT procurements in the small business space are actually quite dull and boring as SMEs purchase commodity or low complexity kit and software on a piecemeal basis as part of the routine maintenance and everyday growth of IT systems – a PC here, a server there. Now, as IT Consultants where all meant to be selling the latest and greatest. We’re meant to be explaining to customers how their lifes and businesses will be transformed by implementing all this cool techy stuff, when really those business owners are all thinking “how much is this going to cost me”? You can’t change a whole business culture overnight and as IT Consultants we have a lot to do to become trusted advisors to small businesses! A colleague of mine, Simon Mitchell of RootIT, informed me yesterday that Ethereal is now Wireshark and here is the press release. I’m not sure about the name change but it’s the same great product which every IT Consultant should be aware of. It’s a network packet sniffer so it can capture the network traffic on a LAN and decode it for you, as it has inbuilt knowledge of a wide variety protocols. It’s cross platform and so can run on Linux, Windows, Unix and others and it’s FREE! Why you can't run multiple SBS 2003 servers? I’ve been discussing why you can’t run more than one SBS 2003 server on the same network (subnet) on the Yahoo SBS Groups and there is a reply from Jeff Middleton MVP which gives a detailed explanation. I think it is so important that I’m reproducing his reply here. Does this guy know his stuff or what!! I can clarify a couple of points of confusion in the thread. I agree with what Vlad asked about and was supported by others, you can plug a bunch of SBS servers into the same subnet, not a problem. They don’t mind being neighbors or sharing a gateway, whatever. The more important question here I do want to clarify just so everyone does understand the Swing process and why the constraint of behavior is as it is. Now, there’s a misconception about what I say in my documentation as it was relayed in this thread. I do actually recommend that you install the TempDC and the FinalDC using the same media. This isn’t because it accomplishes some magical solution, it’s just a simple way to say “if it works to build the TempDC, it will work the same way for the finalDC”. It’s also true that you can use non-SBS media if you like. No matter. Oddly enough, all three of those rules don’t apply during the very initial period after you install from the media. That means, there’s a period of hours and days applicable to the combination of those three things. I can assure you that after a period of weeks and month(s), you will find enforcement causes all SBS servers in the LAN to become non-functional for production use if they don’t match that set of criteria. On the CRITICAL point I make about not ever plugging the originalDC and the FinalDC into the same network together, this MAJOR PROBLEM has nothing to do with SBS. What it relates to is that the point of the Swing is that both these servers are identified in the AD by essentially identical characteristics in the AD, that’s the point of the exercise. The differences are extremely subtle to the point of not mattering, but here’s the issue: The believe as far as can be identified in AD that they are the same DC, and they are storing cloned replicas of Active Directory that at some point back (when you split off the TempDC) began a split reality in the life of their AD. Starting with identical AD conditions, you went through your offline construction process to wipe out substantial sections of AD (Think: exchange and the original DC) and those changes are present in the originalDC’s view of AD. If you let these boxes see each other, there’s a really good chance they will attempt to “play the transactions” from both AD experiences against each other and totally obliterate the AD from having a usable condition. They can effectively destroy it on both servers. It has nothing to do with SBS, it has to do with having violated a basic rule in Active Directory design: you cannot reconverge diverged AD realms without exceptionally complicated issues being addressed. Certainly you don’t want to have major modifications to the very DCs in question as part of the changes. Finally, the thing on the DHCP collision, you should expect that if you plug together (n) number of SBS servers on a common subnet, you will probably have (0) DHCP Service running in short order. I believe they will all shut down as soon at any two recognize the other. Of course, this can be a really amusing thing, sort of a brain teaser because I think I can also predict that it depends upon how you do the test. (Not that this matters to anyone) If you plug them in and turn them on one at a time, the last one to boot will run DHCP, the others will all cause one another to go off. If you plug them all into a dead switch, then power it on all at once, they probably all shutdown. In other words, if any two see each other’s DHCP service active by doing an announce and reply, they both shutdown. The things that drive us! We all have things that drive us, that make us, that define us! The things that define me are my faith as a Sikh, a son of a migrant family (originally from the Punjab in India) with almost no formal education, who crossed 3 continents to make a live in Leicester. They did this to give their kids the best chance in life they could. This story is repeated many times over for many of my fellow sikh brothers and sisters who left thier homeland to make a life here! We are now doctors, lawyers, accountants, business people, software engineers and even Microsoft Small Business Specialists! Wherever we go we take our faith with us, but always contributing to the society we live in, never apart or separate from it. Listen and enjoy, even if you don’t understand it (just click on the link called “Ik Onkar” and listen past the advert for a “Rupee Chequing Account”). There are many people who do not have a faith in God which is fine as Sikhism is not a religion which advocates conversion, but it’s about having a sense of spirituality, a sense of morality, a sense of ethics and putiing that in to practice in everything that you do. Well, I did say they couldn’t sustain their current business model. Lets make everything appear so cheap, blitz people with our advertising and endless offers! Let’s compete on price, price, price. Do they innovate and do loads of R&D (like IBM) or do they just try and shift more and more boxes on wafer thin margins? It’s just not sustainable! I like The Register analysis of this? Dell’s excuse is that it’s the weak global economy, so I know let’s drop prices even more! Don’t get me wrong there’s nothing much wrong with their technology but on the server side there’s nothing much to get excited about. The problem is that within the small business market no one really cares about that anyway, so what if IBM servers use vectored cooling, lightpath fault diagnostics, onboard RAID 0/1 as standard, chipkill memory and sophisticated management software. Do Dell have expert partners in the channel backed by an extensive support network and technical/sales training to deliver the right solution to your business. Not on your nelly, they are only interested in parting you from your hard earned cash and they’re damn successful at it! Just don’t ever ring Dell and ask them how to network 2 computers together! Well, the UN is powerless to stop bombs dropping on a certain country at the moment but hey it ’s got some great resources on open source. So all is well with the world! O’Reillynet has a good article on the UN and Open Source. The International Open Source Network (IOSN) has some great resources including tutorials on Openoffice.org and end user guides for using the Linux Desktop (with Screenshots), which you can use under the Creative Commons Attribution License. Yeah, they made loads of money and you can pour through the figures yourselves (that’s the limit of my financial analysis skills). Interestingly enough they spent $1.1 billion on certain legal charges! That is a lot, isn’t? I have no way of knowing whether this is typical of a company of the size of Microsoft or not? They expect to make loads more money in the future, yes it’s true, they say so in “Business Outlook”. It’s good for partners such as myself and bad for competitors because what this means is that their strategies just aren’t working! The fines took a sizeable chunk, but who cares when you make so much money. Microsoft is a money making phenomenon which sometimes you just have to admire?! We're far too technical ! I was reading the new SMB Partner Community magazine, hot off the press, which I got from the West Midlands SBS Group Meeting, probably torn from the clutches of Harry Brelsford, SBS Guru, demi-god and small business consultant extraordinaire. One of the key quotes from the magazine (in my humble opinion) was from a picture of a Microsoft internal small business summit where it was aligining its small business partner and customer messages. Now, does it take such a summit to come to this amazing revelation? However, it’s a constant reminder to us that we need to “walk a mile” in our customers shoes to understand their issues! Yes, I know you’re sick of it, who cares, so what! Well here is more on Groklaw and it just gets more interesting to me anyway, so there. I’m just going to have to download this damn plugin now and try it out just to see how bad it is. Look at this blog about the ODF called the An Antic Disposition. One of the best reasons to have both Openoffice.org 2.0 and Office 2003/2007 installed together is that you can load your office documents using Openoffice.org and convert to PDF! Where’s the PDF support in Office? Well er, better not mention Adobe! Damn out it slipped! There was a recent announcement that Microsoft and Xensource would be cooperating. I never understood what this was actually going to give us all. Yes, The Register has an analysis of this announcement and frankly it makes some sense to me. 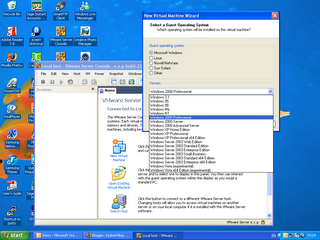 I’m a user of VMWare server and run a SunFire v20z (AMD64) server running SuSE Linux Enterprise Server v9 with VMWare Server which hosts SBS 2003 Premium Ed for customer demos, which works like a charm! I tried to use Virtual PC but it just wasn’t intuitive as to how to set up the guest OS and I just couldn’t find any useful documentation, so I just gave up! 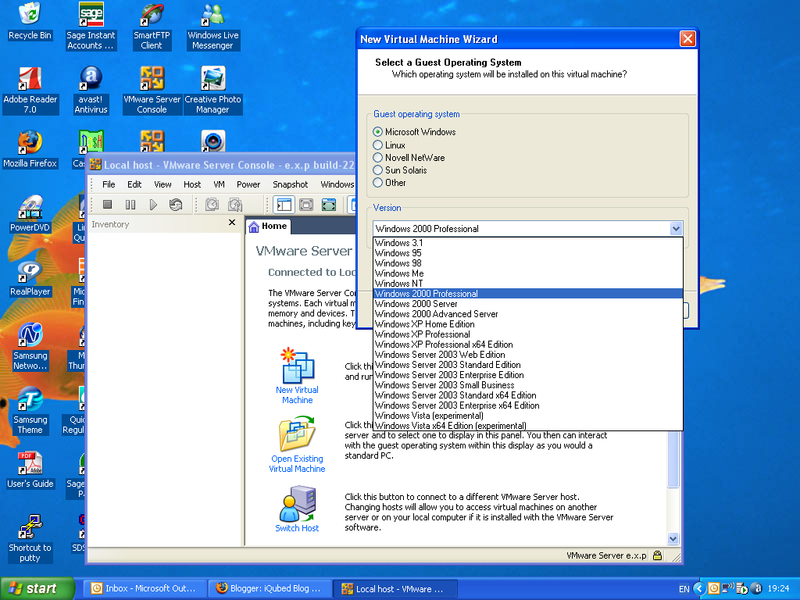 On the otherhand VMWare Server is just so simple to set up, I could get my 6 year old son to do it, blindfolded and with one arm tied behind his back! Okay, may be not that easy but get the point! Just look at the image to see the range of guest OSes it can support. I’m sticking with VMWare Server for now, although I think Xen looks interesting and as I’m an OpenSUSE 10.1 user as well (and it comes as part of that distribution), then I respect its open source background. The fightback has started from VMWare!